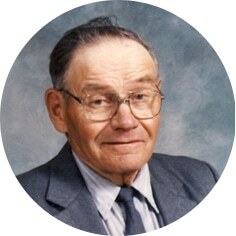 Edward Lawrence Berger, aged 91 years of Central Butte, SK passed away on Monday, January 28th, 2019. The Funeral Mass will be celebrated on Friday, February 1st, 2019 at 2:00 p.m. in St. Mary’s Roman Catholic Church in Central Butte, SK with Father Hector Seville as the presiding celebrant. Ed lived his entire life in the Central Butte area, farming on the original homestead until 2001 when they moved into town, and continued to farm until 2010. Ed married Gertrude Marie Gagnon on November 18th, 1954 and together they raised four sons. Ed loved watching hockey, playing cards, and reading, but mostly loved visiting and reminiscing with anyone and everyone, always accompanied by his trademark heartwarming grin. He was predeceased by his wife, Gertie in 2011; parents, George and Margaret (Gerle) Berger; siblings: Joseph, Elizabeth, Anthony, Anne, John, Bernhardt, and Jacob. Ed will be lovingly remembered by his sons: Brien and granddaughter Teanna, Raymond and grandson Chris (Kristi) and great-grandchildren Dominic, Hayden, and Joey, Keith (Jan) and grandchildren Orrin (Adriana), Ethan, Garrison, and Devin, Michael (Jennifer) and grandchildren Kenzie and JJ; as well as numerous nieces and nephews. In lieu of flowers, donations in Ed’s name may be made to Central Butte Regency Manor, PO Box 40, Central Butte, SK S0H 0T0, Central Butte Iver Main Place, Box 550, Central Butte, SK S0H 0T0 or to a charity of one’s choice. Arrangements are entrusted to Moose Jaw Funeral Home, 268 Mulberry Lane. James Murdock, Funeral Director 306-693-4550. Our deepest sympathy to all the family. Let your memories bring you peace. I am hoping to come up for the funeral just depends on the weather. Thanks so much! It will be good to see you if you can make it! ” A time to be born and a time to die”. I believe that life as Uncle Ed knew it ( I hope I am not being too presumptuous by calling him uncle) , has been over for him for quite some time and that he is in a better place now. Along with his beautiful smile, I will always remember him as the greatest dancer…EVER! A dance with Uncle Ed and Aunt Gertie’s ham. It doesn’t get any better than that! Great memories. Wish we could be with you, but just not possible. Raymond, Brian, Keith, Michael and your families: know that we are grieving with you. Thinking of you at this time with the loss of uncle Ed. Mom sends her thoughts and prayers to all the family. Due to moms poor health she is not able to attend the service. Hope you are doing ok at this sad and stressful time. I loved my Uncle Ed. Although we saw each other infrequently because I live in Hamilton, we always had a good visit. I especially remember and cherish how he used to show me the family photos and reminisce about them. My thoughts and prayers are with my cousins Keith, Raymond, Brien and Michael and their families. So sorry to hear about that loss of your father. Though I haven’t been back to Central Butte since my mother passed away 14 years ago. I still remember my time there fondly. Your parents were special to me and I still think of them often.